Entering 2014 there is no obvious disaster sitting right in front of us such as a sovereign debt default or a new major war. There is no immediate rogue wave catalyst for a serious decline in risk assets. 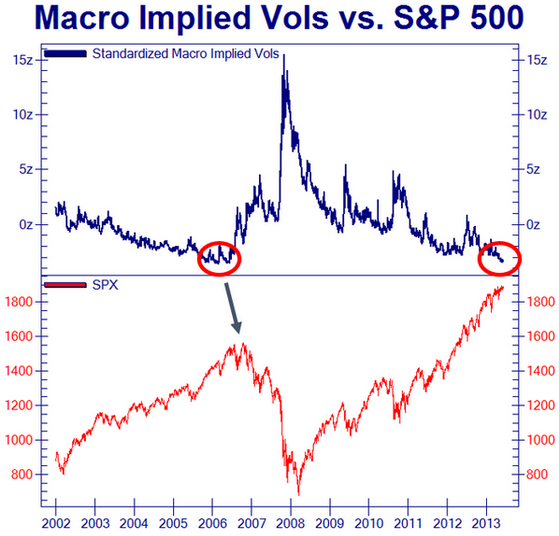 Because of this, market participants have entered into a period of unprecedented complacency. As we will see, this complacency is the true danger that faces the market. While a large portion of the U.S. stock market has been clobbered during the first five months of the year (some of the 2012 - 2013 high flyers have fallen 40% to 60%), the major indices have grind higher, and the complacency has continued to spread across the financial system. Market rallies usually top when they have participants feeling the most at ease that nothing could possibly go wrong. One of the best measures of this sentiment is the VIX index (also called the "fear index"), which continues to reach to new lows. The last time the markets were this complacent and assured that nothing could go wrong was during the peak of the last cycle in late 2007, circled in the graph below. See Flashback To December 2007: What Was The Outlook For U.S. Stock Prices?